Destination weddings provide the couple and their guests to a magical experience that will make a wedding day a memorable one. Although destination weddings can be costly, here are some tips to make your destination wedding an affordable yet classy one. Location – Look for a destination that offers affordable wedding package and is inexpensive to travel. 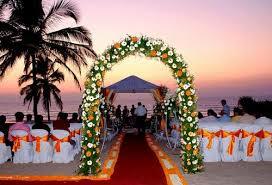 Places such as Hawaii, Jamaica and Mexico are great locations for wedding. Since the competition is so stiff in these regions, couples will be able to benefit from the affordable wedding packages. Less Guests- Destination wedding means that not everyone you invite, will attend your wedding. Which means that instead of celebrating your wedding with 300 strangers, you will be able to spend it with 100 or less of your close family and friends. This also means that you can treat your 100 or so guests to a wedding experience that they would never forget. Less decor- Usually a destination wedding needs minimal decor, since the wedding location is always a scenic one. Honeymoon- Usually you would need to travel to celebrate your honeymoon, but if you choose a destination wedding you’re already on your honeymoon. Take advantage of group travel and stays- Make sure you travel as a group of 20 or more to take advantage of discounts on airline fares. Hotels will also provide group discounts for large wedding parties and guests. For a even better deal speak to trusted travel agent, who would be able to include hotel transfers and tours for free. What should the mother of the bride/ groom wear?